The Sony Ericsson Xperia active has the latest version of the Android Market, featuring a facelift with a bit of WP7 styling. New sections are available such as Staff Picks, Editor’s Choice and a dedicated Sony Ericsson tab, courtesy of the maker. So, this is an Xperia mini in a wetsuit. Some people will be less than impressed. One hand on the remote the other deep in that bag of chips. The kind that just can’t be bothered. The Xperia active on the other hand doesn’t want to be on the safe side. It won’t take rain checks. The rugged droid is at the end of our training range – sweating but not gasping. Hardly a surprise – we knew all along there was a solid smartphone inside the durable shell. The Xperia active delivers the complete Android experience. A neat little phone that does things almost as well as an Xperia arc. It’s a well built phone too with a distinct outdoor styling. 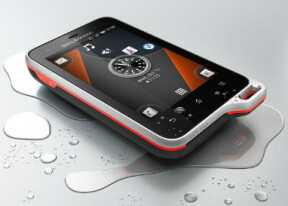 The first dust proof and water resistant droid by Sony Ericsson is well protected against the elements. The one thing to warn against is the less than stellar battery life. You know, it’s a phone that can take a lot of abuse but not the right kind of gadget to spend days out in the wilderness with. However, if a rugged smartphone is a must, the Xperia active fits the urban survivor bill. So, if you’re on the market for a durable smartphone, it’s Android or nothing. The niche doesn’t seem all that crowded but it’s not free of competition either. A big (literally) rival of the Xperia active is the Motorola DEFY+, which builds on the original DEFY and adds, among other things, actual IP67 certification. It’s got a bigger and higher res display and a better battery to match. We’re yet to see though whether a 1700 mAh Li-Po unit that needs to power a WVGA 3.7-incher will make that much of a difference. Otherwise the rest of the specs pretty much on par. The Samsung Galaxy Xcover is another full-size rugged droid but obviously not as sophisticated as the Xperia active. With the right price tag though, it could be quite an attractive deal. We think the compact size is quite an advantage for the Xperia active. If nothing else, it sets the phone apart from the competition. And the whole package is built on a concept that’s proven to work. In the entire Xperia lineup, the mini is the right one to have a rugged version of. Compromises are inevitable in the ultra-compact class. Screen size is among the few the Xperia active makes. This rugged droid is genuinely trying not to take too much space. And it doesn’t mind living on the edge.